Each Spring we get a lot of questions about the use and effectiveness of cattle guards. Whether it’s selecting the proper load-rating, to what animals they truly work with, a few quick, concise answers can provide decades of convenience and security. Below is a quick outline of the various types, load ratings, benefits and dangers to be aware of when using these effective livestock barriers. It’s probably obvious, but cattle guards don’t require any effort to operate! Once installed, there really isn’t anything to do except drive across them. On the other hand, the typical livestock gate requires quite the production to use. The routine is to drive up to the gate and stop, chase any animals away from the opening as possible, jump back in your vehicle and pull through to stop yet again. Now, quickly get out and close the gate behind you before any of your herd decides to escape. This is a tedious process and all but impossible when there is a group of animals near the gate. Add a bit of weather or cold temperatures and it really becomes a hassle. Frequently crossing a fence-line with hay equipment, tractors with feed or deliveries almost necessitates a more convenient option than a manual gate. If the logistics of operating a gate are tough for you to deal with, imagine how attentive others will be when crossing your fence-line. If you have third parties that need access to your pasture, such as maintenance crews for cell phone towers, oil rigs etc, they may not be as careful as you are when using them. In fact, they may even leave it open thinking they’ll be back before an animal notices it’s open or forget to close it altogether. There’s nothing like having to find and chase down your cattle because someone forgot to close a gate! A cattle guard will provide peace of mind knowing that it literally cannot be left open and your animals will always be safe, secure and right where you left them. No sleepless nights wondering if a gate was left open and no more calls from the neighbors or police about wandering animals. There are a few different cattle guard designs out there but they all rely on the ability to present unstable footing and depth perception as deterrents. The combination of the two create a very effective livestock barrier! – Walking on a rounded surface with a flat foot is a difficult task. Try it with a large hoof and an extremely rounded pipe and you will have a tough time balancing. Add a 1,000 pounds and you have real trouble! We’ve all stood on top of a small, rounded rock (imagine crossing a stream) and realized how difficult it is to balance on the small, rounded surface. This is still difficult even though our foot does have some flexibility in it to help grip the rock. That is the design and physical component that makes cattle grids so effective. The round pipes that make up the top of the guard create an extremely difficult and physically uncomfortable footing for a large-hoofed animals. Unable to get any kind of secure footing, they simply cannot put any weight on their leg for a place to stand. The rounded surface doesn’t allow them to gain any type of stable footing. This sensation is extremely uncomfortable, unpleasant and so physically demanding that they remember this strong deterrent in the future. This will help keep them from challenging the barrier in the future and most will shy away when it’s presented again. Although some will never test it or put a hoof on the first rail, those that do don’t usually put weight on the first step and retreat to ‘safer pastures’. The vaulted area dug under the guard creates a confusing and frightful illusion for cattle. They see the deep area under the guard and get the sensation that they can fall. This confuses and distorts their depth perception when approaching and usually creates the desire to turn around. There are some studies out there where a roadway was painted to create an optical illusion of depth, like that seen with a traditional cattle guard and almost all of the cattle that encountered it wouldn’t go across. It was just paint on flat pavement, but the illusion was enough to keep them from crossing. Most ‘Texas Gates‘ are constructed out of steel and finished in either a powder-coat or directly applied enamel paint. In the rare case, they may be galvanized however that hot-dipping process does add substantial costs. Concrete can also provide the same visual and physical deterrents to livestock that steel does. The nice thing about concrete is, you can order forms and make your own. Simply drop in the re-bar, pour the concrete into the form and removed to install in place when ready. The concrete cattle guards do come with an HS20, 16 ton/axle rating and you may pour as many as you like with a single form. Most farms and ranches don’t need the DOT 16 ton per axle rate and will install the more economical private use cattle guards or go with the 12 ton per axle rating. They are much more economical and will still carry a fully loaded semi-truck but be sure to check with your local governing agencies before installing a cattle guard on your property. Some municipalities require specific ratings for government and emergency vehicles such as fire trucks that may need to access your property. Although they work extremely well with cattle, they are not designed to prevent all animals were crossing. Small hoofed animals are quite agile and can balance easily on the rounded surface. The smaller ‘foot-print’ allows them to balance quite easily so they don’t encounter the same unstable footing that presented by a large hoof. Goats are a prime example, you won’t keep them in with a cattle grid. Horses: A special note is needed here as we do not recommend cattle guards be used with horses. Their slender hooves are able to slide down in between the rails which exposes their long, slender legs to high leverage and possible breakage. During the panic to remove themselves, they will struggle and could easily break their own leg in the effort. We highly recommend only traditional gates be used to contain horses. Cattle guards provide an effective livestock barrier and a convenient method for vehicular traffic and equipment to cross fence lines while eliminating the risk of an open gate and a free herd of cattle. With proper installation, these gate-less entries can provide decades of containment for your largest groups of cattle. If you have any questions or would like help selecting the proper guard for your operation, please contact Barn World Livestock Supplies today and they’ll be happy to help! Lately we’ve been receiving a lot of calls for cattle guard quotes from horse owners looking to contain their equine. I wanted to give a quick review of why they’re not recommended for use with horses and why a traditional livestock gate is your safest alternative. Although cattle guards are very popular and provide the ultimate ease of access to all your pastures, they can also be very dangerous when used with horses. Horses typically have a more slender hoof and leg than cattle and this physical difference can allow a horse’s hoof to slip between the cattle guard rails and slide all the way down to the bottom of the vaulted area. It’s slender hoof can also easily slip off the rail and damage its ‘ankle’. This exposes one of the weakest parts of their leg directly to the cattle guard rail itself and once in this position, the scared animal’s flight instincts kick in and it will struggle to free itself. During the attempt to flee its precarious position, it can easily break its leg and put its own life in jeopardy. It is an extremely difficult thing to see and and its extremely difficult to even assist the horse in freeing itself. A horse with its leg stuck in a cattle guard is not something that you ever want to have happen to your equine. The safest and only viable alternative to a cattle guard for horses is a standard gate. It may be less convenient than driving over a cattle guard, but it is certainly safer than exposing your horse to a possible broken leg. As a quick side note: There are other hoofed animals they can easily cross the barrier. Goats, sheep and other sure-footed livestock that are very nimble can quickly learn how to get across the curved rails. Of course animals with pads, such as cats and dogs can also learn to tip-toe across the rails and escape to freedom! If you’re considering using a cattle guard where horses are present, we would suggest that you use a traditional farm gate or livestock gate and realize the inconvenience of operating the gate is well worth offsetting the risk of injury to your horse. If you have any questions or if we at Barn World Livestock Supplies can help with your cattle guard decisions, please let us know and we’ll be more than happy to help. Cattle Guards – an effective invisible livestock gate! A properly installed cattle guard is an effective and popular livestock control devise that saves valuable time and effort. Available with the highly effective round top-pipe for the maximum hoofed animal deterrent and the flat top-pipe which provides a smoother ride for your vehicles while creating a barrier for livestock, it is easy to establish a safe perimeter to your pastures while granting the best ease of access possible. It won’t matter who’s crossing your land, they will never leave a gate open and cattle won’t be wandering off on their own. Keep your livestock safely contained with a simple and very effective cattle guard. There are many different types available, but the most common and effective are the flat and boxed options. are the traditional style in use all over the country. Typically they’re made by welding round pipe to the top of heavy duty c-channels or I-beams. The design calls for them to be mounted over a vaulted or open area with concrete footings to hold back the dirt and provide a foundation to transfer the weight of crossing vehicles to the ground. The vault area underneath the rails creates a void and the important visual perception of depth needed to deter an animal attempting to cross. Proper installation of the foundation is critical and a contractor familiar with the local soil conditions, including soil freezing levels and drainage issues should be consulted to ensure a long lasting crossing. are identical to flat cattle guards but are designed to lay directly on the ground. They have a steel skirt welded around the perimeter to keep dirt from creeping in underneath and are very popular in low traffic, low-speed areas. These include construction sites where cleaning dirt from equipment is necessary before entering public roadways. They are very popular as washout sites, used when hosing off trailers and other vehicles and allow for the water and dirt to drain away, and also as rumble strips that shake the dirt off before leaving a site. These ‘semi-portable’ guards can be relocated from site to site as needed. Boxed cattle guards are also popular for residential use and other low traffic areas such as cellular antenna towers, oil rigs, and any unattended maintenance area that require roaming livestock be kept at bay. The AASHTO (American Association of State Highway and Transportation Officials) provide axle load ratings for cattle guards to be used in public installations. Rated cattle guards are certified to meet the requirements of state and federal entities such as the Department of Transportation. Private use cattle guards When used on private property, certified load rating certificates are not required. This fact alone can save hundreds of dollars on a single cattle guard even though they’re built to the same specifications. Private use guards will handle fully-loaded semi truck trailers as well as farm and ranch equipment. Very popular on private driveways, these cattle guards can be more economical. 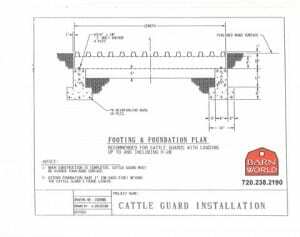 If you need any help with your cattle guard project, would like a quote with shipping or have any questions at all about cattle guards, please contact BarnWorld.com. They have all the livestock supplies you need for your farm and ranch! A simple Texas Gate provides security and peace of mind for your farm and ranch and is one of the most valued assets of livestock equipment available to the modern rancher today. Gone are the days were you would have to stop and get out of your vehicle only to drive forward, stop again, get out and close the gate behind you. With a cattle guard, you won’t worry that someone may have left a gate open releasing your animals to the great unknown! A simple cattle guard, when properly installed, will provide years of worry free livestock control. 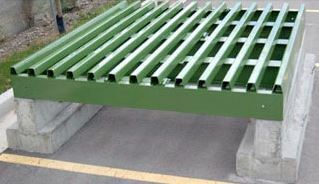 Traditional cattle guards are made from c-channels or I-beam load supports with either round or flat top piping. Round top-pipe provides a greater deterrent for livestock by creating not only a rounded surface that’s more challenging to balance on, but also a greater visual deterrent. The curved edges create greater shadow contrast making it look even more imposing to animals. The combination provides an effective deterrent for livestock and other flat hoofed creature. provide a physical barrier while also creating a smoother ride for passing traffic than the round pipe. They’re most popular on heavily traveled roadways and provide a smoother crossing for high-speed vehicles. Although better for crossing trucks and cars, the flat surface will allow for a more stable foothold for animals and thus have a slightly less physical deterrent than round piped guards. Boxed guards are quite common in the construction industry. They are traditional round top-pipe cattle guards with a steel skirt welded around the outside to prevent dirt from creeping into the open vault area underneath. They’re designed to lay directly on a flat surface and can be used as a construction site washout or a dirt rumbler to clean debris from equipment before leaving a job site. They are also convenient in that they can be transferred from one site to the next as work requires. Barn World Livestock Supplies offers a custom guard built for ATVs and designed to be inserted directly into a fence line. It’s a simple and effective means of quickly adding access to other pastures without creating the need for a permanent guard that requires concrete footings or vaults to be dug. Just cut your fence and drop it into place for foot or atv access. Balancing a flat hoof on a round pipe is a difficult proposition for most animals. There are some exceptions: goats, sheep and other surefooted livestock can cross cattle guards fairly easily and your soft-footed barnyard friends such as dogs & cats will be able to walk right across. Please note that cattle guards are not recommended for use with horses. Their smaller and slender legs can slide down between the rails and be expose to breakage at their weakest point. Being a flight animal means that they will struggle more fiercely out if panic to get out and unintentionally increase the risk of injury. The best barrier for these animals is a swing gate. Simple and effective, cattle guards provide a swift and maintenance free method of ensuring your livestock stay on your ranch. You will never need to open and close gate again and you’ll have peace of mind knowing that a gate somewhere has been left open. If you have any questions about installation or need and long-lasting heavy-duty cattle guard for your farm and ranch, contact Barn World (720.238.2190) as they have a large selection and a knowledgeable staff to help. Cattle guards are an indispensable part of managing livestock. Their simplicity and ease of use, combined with their longevity, make them the ultimate Texas gate. A concrete cattle guard foundation will ultimately be a thick, four-walled ‘box’ and is recommended to be poured after the arrival of the cattle guard. The depth of the walls is not a one-size-fits all measurement, but is determined by the local conditions such as drainage, soil type and freezing levels. It is important that a contractor who is familiar with the site conditions be consulted so that the foundation will provide a solid and stable base for the cattle guard to rest on. The support beams do not rest on the vault walls, only on the footers to transfer the weight of the passing vehicles to the ground. Generally, it is suggested a trench, about a foot deep and wider than the guard itself be dug. The cattle guard foundation walls should be at least six inches wide to make up the ‘vault box’ so that dirt will not collapse the walls and the footers should be large enough to support the passing vehicle weight and transfer the load to the ground. We typically see 12 inch walls that are eighteen inches deep to support each load-bearing beam of the guard. Depending upon your soil conditions, drainage may be achieved with a deep crushed-rock base such as a French drain or by running PVC piping through the concrete walls to discharge any excess water. Some areas may allow for natural drainage, but without proper removal of any water, the foundation and thus the guard itself may be compromised. Effective drainage is vital to the longevity of the crossing and should be done with the best possible long-term solution in mind. A boxed cattle guard is a great choice for temporary use in low traffic areas or construction sites. Laid directly on flat ground, they can be spiked into the soil, railroad ties or a set in a firm gravel mix to help eliminate movement. They are great for low volume access areas and don’t require a vault to be dug underneath. A steel skirt is welded directly to the frame and will help keep the area below clear from creeping dirt. Very popular with construction sites, the guards may be moved from location to location and be used as rumblers, dirt shakers, or washout areas to clean equipment before leaving a job site. 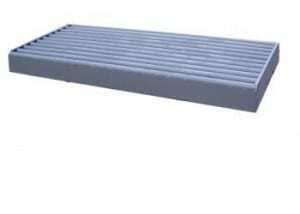 Best used in situations where the cattle guard will be used temporarily, these versatile installations will do well for all types of applications. For ease of use, nothing provides better access to your livestock than a properly installed Texas Gate. You don’t need to manually open and close it or worry about someone leaving it open and your animals wandering off. With proper installation, this convenient and secure access will greatly improve your ability to manage your farm and ranch. Please visit BarnWorld.com to see our selection and don’t hesitate to let us know if you have any questions or need any help with your installation! Cattle Guards, the ultimate livestock gate! Cattle guards offer ease of access to your livestock pastures, farm and ranches while keeping your animals safe from wandering. The simple design allows vehicles to pass through a fence line holding most ranch animals without having to stop and open, then close a gate. If you have through traffic or other people working on your farm, you never have to worry about an open gate in the middle of the night. Top Pipe Options: Barn World offers each of the cattle guard types below with either round pipe or flat pipe on top. The top pipe runs perpendicular to the direction of vehicular traffic and rests directly on the c-channel or i-beams underneath. The weight of the vehicle is transferred from the pipe, to the beams and then to the ground. The flat piping is ideal for areas of high speed traffic such as public roadways and other crossings with a lot of traffic moving at a faster clip. The finish allows for a more smooth transition of the barrier with the least amount of ride disruption to the passengers and vehicle. They can commonly be seen in use by state & federal highway projects. Round Pipe cattle guards are of the same design as the flat pipe and come in 3-1/2 or 4-1/2 diameters. The round pipe causes a bit more vibration on passing vehicles, but is seen as a more effective deterrent to livestock. The curvature of the pipe creates less of a balancing surface for hoofed animals creating more discomfort on the foot and leg if stepped on. It is very difficult for hoofed animals (goats excepted) to get a secure footing feeling while balancing all of their weight on such a small, rounded surface. The curved pipe also creates an optical barrier for livestock. The curvature of the round pipe creates shadows that offer an optical barrier for the animals. A study was done comparing the effectiveness of traditional round pipe cattle guards to white lines of roughly the same width painted on a black road surface to create the illusion of depth. The painted lines were found initially to be surprisingly more effective than first thought. When cattle were introduced to the markings, they we not interested in testing the barrier, but when they had had some time to inspect the painted surface, the eventually were able to overcome their initially hesitation and cross without effort. Once they were able to determine the road was indeed flat, they did in fact cross easily. The optical illusion of a barrier did deter them for a time, but when incentivized to cross it, they did. The researchers found that they still preferred to go around the markings, but didn’t have a problem crossing once the ‘jig was up’. The traditional round –piped cattle guard, couples the optical deterrent with the physical to provide the most effective obstruction. Livestock that are motivate to attempt a crossing and are brave enough to place a hoof on the guard quickly discover that the footing is unbearably unstable and will usually withdraw their hoof. After that initial uncomfortable encounter with the steel round pipe, they will typically avoid it at all costs. We have had reports of some aggressive or spooked bulls attempt to jump over the obstacle. This is usually done in times of panic and some of the larger more athletic bulls can jump six feet or more on occasion. For these more muscular and nimble ‘jumpers’ and eight foot (in the direction of travel) cattle guard has proved to be more than enough to show the animal that it’s a barrier not to be contemplated. Of special note, even round topped guards do not work with all animals. Smaller hoofed farm and ranch livestock such as goats and some sheep can be very nimble and often have no trouble tip-toeing through. Animals with soft pads on their feet are able to balance on the round piping and although not a comfortable footing, they are able to walk across if they desire. A second option available in the selection of cattle guards is the boxed vs. the traditional vaulted that requires a footing to rest on. Boxed guards have a steel skirt surrounding it. The skirt may be either welded into place or be removable. The integral box is a steel skirt welded directly on that creates a barrier for dirt to creep underneath. With this type of box, installation may be made directly on the ground without the need of footings or digging. To clean out any debris that may have built up over time, it is simply drug out of place and then slid right back in. At near 12 inches tall, dirt ramps are built up on either side to allow vehicles to cross over. This type of installation is considered less permanent and is very popular in low traffic areas and construction sites needing an equipment washout area or a dirt rumble to clean vehicles before they enter a pubic roadway. They are also more ‘portable’ and may be move from job site to job site if necessary. The traditional cattle guard installation is done with a concrete foundation (although other materials are also used; ie railroad ties) and a ‘vault’ area is dug underneath to collect debris. Typically, a rectangular concrete foundation is poured to keep the dirt walls from falling in and to provide support to the beams that run in the direction of traffic. Although not considered a difficult endeavor, an experienced contractor who is familiar with the local soil conditions and frost / freeze levels is highly recommended. If not properly supported, changes to the soil during freezing, water saturation or runoff may affect the structural integrity of the crossing and the cattle guard itself. There is also a cattle guard specifically designed for ATV use in crossing fence-lines. We’ve custom built these for golf carts passage as well. Simply cut whole in your fence-line and drop this guard into place. That’s all that’s needed!! Another alternative to traditional cattle guards. These gates pivot and allow the it to lay flat for a vehicle to safely cross over and then return to their upright position automatically. This type of gate has been successfully used in busy feed lots with lots of tractor and truck traffic and provides yet another secure means of keeping livestock in place while allowing access to busy areas. These ratings are used by engineers who issue certificates of design reports and certify builders to ensure the product meets the load requirements for the ratings used above. To achieve the designation, manufacturers must use specific welding techniques, materials and designs before the guard can be certified and used in a public roadway. For most highway crossings, the 16 ton per axle or H-20 rating is used. Non-rated cattle guards do not come with an engineer’s certification and are therefore more economical than the rated. They are used on private property and in some cases made from the same materials and design specifications as the rated. All cattle guards sold by Barn World are built to withstand fully loaded semi-trucks and large farm equipment. They are very popular with traditional farm and ranch operations. Note that we do not offer concrete cattle guards. Although they may be initially cheaper than steel guards, our experience has been that they do not offer the longevity of steel and are subject to quickly cracking and chipping when exposed to the elements. Once it starts, the life of the crossing quickly diminishes and the entire structure will need to be replaced. A steel barrier offers the most durability and length of life for the user. Considered the most effective means for controlling and containing livestock on a farm and ranch while offering the ultimate ease of access for all types of vehicles, steel cattle guards offer peace of mind and security no matter who needs to pass through a fence line. For more information on our full line of farm and ranch supplies, or for any help with your livestock supplies, contact Barn World at 720.238.2190. Cattle Guards aren’t effective for all animals! As we’ve stated in previous posts, cattle guards are not designed as a deterrent for all animals or even all livestock. To illustrate the point, here’s a cute little Beagle on YouTube that summoned the courage to cross a guard on it’s own even thought the gap between the pipes presents a real challenge. This neat little video shows how non-hoofed creatures can navigate their way across and this little guy who is still pretty young was able to find his way. Called by many names; cattle gaps, Texas gates and many more, they are specifically for cows, bulls and deer and some other hoofed animals. The major exception that we don’t recommend them for are horses. The equine animals have slender legs and smaller hoofs that can allow their legs to slip in-between the pipe and when their hoof hits the bottom of the vaulted area, it can expose their legs to breaking at it’s most vulnerable point on the leg. A horse will most likely spook at the surprise of being in such a precarious situation and will probably struggle to get out. This can lead to spooking it’s way to a broken leg which no one wants. We recommend only gates for horses. Goats, sheep and other smaller hoofed, sure-footed livestock are also able to cross the guards. We also recommend traditional standard gates for these animals as well. While they can be an effective barrier for all animals, they are designed for cattle and work best with this type of livestock. Other animals are simply too sure footed, cleaver or have soft pads that allowing crossings without too much trouble. If we can help answer and questions or provide any guidance for your particular project, please don’t hesitate to let us know. We will be more than happy to help with small private plans or larger commercial or public roadway and government jobs. Don’t forget Barn World has a large selection of products for all your livestock supplies including everything from hay feeders to grain bins. Please contact us at (720) 23-2190 anytime! 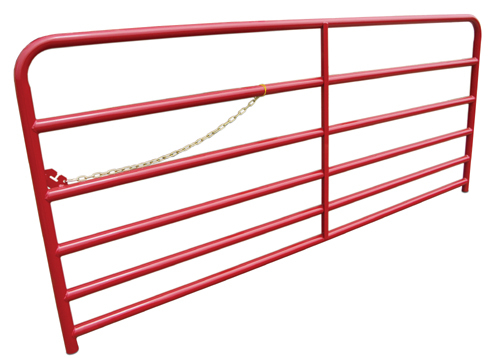 Barn World cattle guards allow easy access to farm and ranch land by eliminating the need for gates. Cattle guards give open access but keep livestock inside. All cattle guards are constructed with heavy wall steel pipe and extra thick steel channel. All ends of these cattle guards are capped to prevent rust. Wings and boxed cattle guards are available with all sizes. Boxed styles are designed to lay directly on flat ground with a gravel under-layment recommended for drainage of these cattle guards. 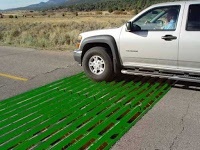 In many cases these boxed cattle guards are used for wheel washes in construction sites, dirt rattlers and for providing access to low or slow traffic sites such as cell phone towers, off-site construction, driveways and other low traffic areas. In all cases a local contractor familiar with soil conditions and drainage considerations should be consulted when planning an installation. The flat style is designed to be mounted on cement footings and is the most popular in high traffic areas such as public roadways. They are bolted directly to the concrete footings that also create the ‘vault’ or empty space under the guard. This provide a visual deterrent to animals and is very effective in dissuading and attempt at crossing. The flat style is a permanent installation and some designs have a hinged area on the guard that allows the center section to be lifted for cleaning out debris that may have collected in the vaulted space area underneath. This feature is not available on all guards, but may be included with most of the highway rated crossings. All cattle guards can withstand the weight of full tractor-trailer loads. The non-rated are most popular for private property such as driveways and access for farm equipment. Rated cattle guards will meet the specifications needed for state and federal requirements such as DOT, BLM, USFS, NP, and US Military installations. They are also used in commercial applications such as mining, forestry, agriculture, and petroleum production. Rated cattle guards are the product of choice for residential usage where city, county, or state regulations require the HS20 rating. Certified structural steel is used in the manufacture of HS20 rated cattle guards. HS20 cattle guards will be certified by an independent engineering firm to meet commercial standards and are intended for government bids. For use on private land, buying standard cattle guards will save you thousands of dollars, are identical in size and are made out of the same materials. They just do not come with the certifications and paperwork all the way back to the steel mill that government agencies require. If a non-rated guard for a private drive is needed, use a standard cattle guard. 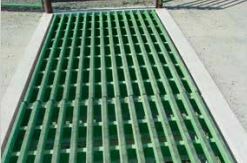 Cattle guards may be constructed with 3″, 3-1/2″ or 4″-1/2″ pipe. The 4″ pipe allows for an approximate gap of 4″ between each pipe and be built with 9 pieces. The 3-1/2″ outside diameter pipe guards have 11 pieces and are approximately 12-1/2″ tall. There is no difference in strength between the boxed cattle guard and the flat styles of cattle guards. These cattle guards are designed to accommodate full semi loads at 10 tons per axle. All cattle guards weigh about 100 Lbs. per foot (a 10′ cattle guard weighs about 1,000 Lbs.). Add approximately 8 Lbs. per foot for boxed cattle guards and about another 200 Lbs. total for winged cattle guards. To use for deer, you may need to place two cattle guards in tandem so you have 16 feet of protection. Cattle guards are easily bolted together to achieve greater distances in the direction of travel and create a larger deterrent for any animal wishing to attempt a jump. Please note that we recommend standard gates be used when containing horses, goats, all small hoofed and sure-footed animals and animals with paws. For a shipping quote, please send us an email with your destination zip code and quanitity or feel free to call the telephone number at the bottom of this page with any questions you may have about our cattle guards. When ordering cattle guards you will pay for the order without the shipping and we will collect the exact shipping cost with a second charge to the credit card used for the order. Note: You must have equipment available to unload the cattle guards from the delivery vehicle when it arrives. The delivery truck will require you to unload the cattle guard with a loader or fork lift or some other means upon delivery. Note with regard to dimensions: Private use cattle guards are NOT built to exact dimensions. Sizes may vary slightly. Adding the removable box option will add about 7″ to the total length and width of the cattle guard. For example, a 12 foot cattle guard will be about 12′-7″. If you have any questions, would like a quote with shipping or if we can help with anything at all, please don’t hesitate to contact us. We’ll be glad to assist in anyway we can. Don’t forget, Barn World is your headquarters for all your farm and ranch supplies including hay feeders, livestock scales, saddle pads and even grain bins. We have a complete selection of livestock supplies for you everyday needs.